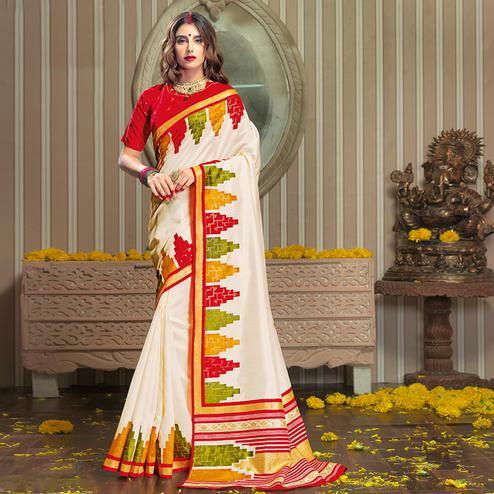 Be the sunshine of everyone’s eyes dressed in this blooming pink-off white colored saree. This saree look has been made rich with it's weaving work as shown. The saree is woven with a chanderi silk material giving a very rich feel to the fabric. It comes with an unstitched matching chanderi silk fabric blouse piece, which can be stitched as per your choice. Style it with right accessories for that complete ethnic look. This saree would surely attract you showers of compliments when you wear it for parties, functions or occasions. Note:- The actual product may differ slightly in color and design from the one illustrated in the images.